Okay, coach, so here's a picture of my soccer team... We were well on our way to winning the outdoor championship this year for our college league... Last year, around the same time, we had an indoor soccer league, which I thought was a disaster. Our team was really good and we won all of our games by at least 12 points. Only one guy in our team scored more than I did, so I think I was doing pretty well handling myself there. Then I got a red card in one of the games for poor sportsmanship. All I did was shake a few guys a few times, then I busted out a bicycle kick... so I got ejected... weird. Then half way through the first final I got another red card for fighting some punk guy from Spain. So in the final game our team was crippled (we only had 4 guys on the field the whole time) and got outran and whooped... So this year we had a pretty good crew with some new people. We played those same guys from Europe again and and them over. It was a pretty easy game when we played them in the first round. I got a few assists and we dominated most of the game. Then suddenly, with three games to go and we 7 points ahead of the runnerup, there was this situation that snuck up on me unexpectedly. It was one of those frustrations of life that you just have to get used to and let it go. So summarizing a longer story than I care to tell, I quit going to the games and we lost the final game by 7x2. 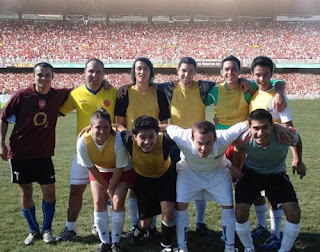 Our good goalie, "Iguita" (Ciro) was also absent that day... but I think I would rather remember our team (with Maracana photoshopped into it) for what we were overall. I had a lot of fun during that season, independently. One of my dreams in life from when I was but a little lad in poverty was to own a pair of white Nike cleats. That season, I played on Nike's kanguroo leather white cleats. That alone was worth it all. Anyway, the only reason I can think of for posting this was that I'm about to put somethings in order and through it down here in my humble home office, so I thought I'd warm up starting my night with action so I'd get going with my big undertaking. I'll probably end up blogging about my new set up once I finish it. Yes, I will be the first one to admit that some of the ideas found here are based on Michael Scofield (I'll give you a cookie if you actually know what I'm talking about without checking it on Wikipedia), though most of what I visualize has been in the works for a few years (Weatherford)... So yeah, it's good to set goals. "You cannot change destination overnight, but you can change direction overnight." "Success is doing ordinary things extraordinarily well." "The few who do are the envy of the many who don't." "Time is more valuable than money."